Wind Wishes began....with a wish. When I was 5 I wished that no one had cancer, especially kids. I came home from school and asked my mom and dad if I could cut my hair for cancer. Alas, Mom and Dad weren't sold on the idea given that my hair didn't (and still doesn't) grow very fast and I really didn't have a heck of a lot to cut off. What they did say, was that if I came up with another way to raise money for kids with cancer they would support me in any way possible. Fast forward a year to the beginning of grade 1, all I ever wanted to do was make crafts, day and night. 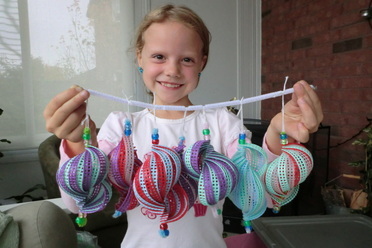 Our family went to a local Fall fair where I learned how to make wonderful wind spinner ornaments. Two weeks later with a box of ornaments in hand I went to my parents and told them my plan - to sell ornaments and raise money for Paediatric Cancer. So at the age of 6, I started to sell ornaments to friends and family and split the proceeds between the Children's Wish Foundation for kids coping with cancer and the Canadian Cancer Society for paediatric cancer research. In my first year I sold over 800 ornaments and raised $1,780. My simple ornaments have expanded to include new ornaments each year, and my little sister, now 9, is entering her third year of adding to the Wind Wishes ornament collections. Our first five years have seen over 2,663 ornaments sold - across Canada, in the United States and we know of others that have reached Scotland, Ireland and the United Kingdom. To date with your support Wind Wishes has raised over $10,000! Thank you all for your continued support and for following my journey.